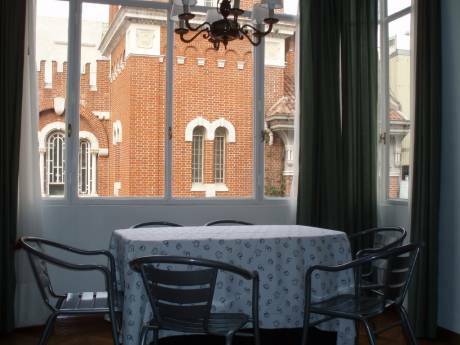 Villa Crespo is a neighborhood located to the center of the Autonomous city of Buenos Aires. In this neighborhood there is placed the "Conventillo de la paloma", which gave name to Alberto Vaccarezza's famous sauce. A plate was placed in honor to Vaccarezza, Other Buildings are The Conservatoire Odeón, The Workshop of los hermanos Máspero, The Hotel Imperio, The Drugstore "El aguila", The Complex of the Factory Dell'Aqua. Between the business premises they tell themselves pizzerias as Imperio or Napoles (the latter recently changed of the corner of Dorrego and Av. Corrientes, to meters on the mentioned avenue) and restaurants like Comander, Los amigos or Los Chanchitos, very crowded. As the only supermarket casher of the neighborhood, it is "100 % Casher", which is opposite the temple ACISBA. Between the bars there is the centenary bar "San Bernardo", where the players of billiards alternate with those of pool whereas in the tables there are organized items of dominoes. Another bar is "Los bohemios". Many of these streets were frequented by the writer Leopoldo Marechal, author of the already classic Adam Buenosayres, who lived in this neighborhood between 1910 and 1934.